Today, social media profiles have moved beyond friendly fun to create definitive impressions on both professional and personal contacts. As a result, it’s more important than ever to understand how your profile is perceived. 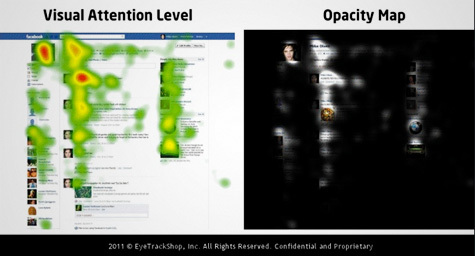 To determine what people really see when viewing your profile, Mashable.com conducted a study with the eye-tracking startup, EyeTrackShop, to apply the emerging eye-tracking technology to the social media spectrum. 1. Pictures Take Priority – Profile photos were what garnered the most visual interest on Facebook and StumbleUpon. 2. Contacts Hold Clout – The thumbnail photos of people you know gained notable attention on Google+, Twitter, Facebook, and Klout. 3. What’s on Top Comes Out on Top – Content on the top of a profile page consistently had more views that anything on the bottom. This was especially apparent on Pinterest, Digg, and Facebook, but less so on YouTube and Twitter. 4. Profession Can Matter Most – LinkedIn viewers noticed job title more than any other element on the profile page. As you can see, viewing priorities were often affected by the content and purpose of the social media site. Still, these findings can help people prepare a better profile by showing the importance of the visual in the land of the virtual. To incorporate innovative strategies into your marketing mix, contact MDG Advertising today.